Tell us about yourself. 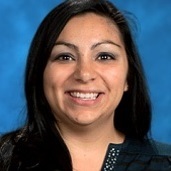 My name is Kara Massey and I am a 6th grade teacher at St. Thomas Aquinas School in East Lansing. I started here in the 2013-2014 school year as a fourth grade teacher. As a teacher at St. Thomas, my students would probably say that I have very high expectations for them: academically and spiritually. I like to get to know my students personally. It is important that I know what is going on with each one of them inside and outside the classroom. I like to make them feel successful and help them to build a stronger personal relationship with God. Describe your school from a teachers' perspective. St. Thomas Aquinas School is a school with caring educators that look to develop each student’s God-given talents and abilities. We are able to do this through strong instruction with Christ as our lead teacher. Students are provided with the tools and guidance necessary to grow and learn in a small classroom setting. This allows students more one-on-one time with their teacher so they are able to achieve their goals. Students at STA look at each other as children of God, so respect and friendship is strived for in their daily interactions with each other. STA is also a leader is service. From our Adopt-A-Family program, to volunteering at the Volunteers of America, or our monthly food bank collection, students are always provided the opportunity to be charitable and give to others. We are also a school of prayer. Every Monday, the whole school joins in the gym to start off with a morning prayer. Daily, prayer opens and ends each day. Every classroom has a prayer corner with notebooks, intention baskets, or books where students can pray and reflect. In the older classrooms, you can find students completing their Lectio Divinia for the gospel reading of the day. Another blessing is watching our middle school students mentor the younger students in our building. Eighth graders exercise with preschoolers in the gym, sixth graders invite all grades to participate in “Divine Mercy Thursdays” where they show a younger student how to pray The Divine Mercy Chaplet, fifth graders pair up with kindergartners during mass, and you can see buddy projects all down the elementary hallway. We are a big family here at STA and I think that is what makes our school so welcoming. What drew you to teaching at a Catholic school? 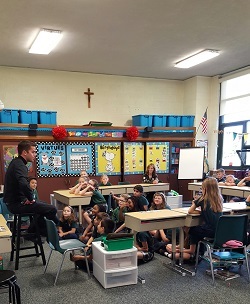 Although, I went to a Catholic elementary school, I never thought that I would ever teach in one because I have a special place in my heart for public education. My husband and I moved to Michigan in 2006 and I taught fifth grade for Lakeshore Public Schools. We moved up to the Lansing area in 2011 and I stayed at home with my two young boys. I started to really miss the classroom. In order to fill that void, I started volunteering at St. Jude Church as a religious education teacher. During that time, I got back in touch with the basics of my faith. It was a very cool opportunity to re-learn and teach some of the concepts on which my life was based. It was then that I decided that Catholic education was the missing link in my teaching career. I started applying to Catholic Schools and St. Thomas called. I sat through one of the hardest interviews of my life and then completed another round where I taught a lesson for the interview panel and a select group of kids. I was hired later that week! What is your favorite part about teaching? My favorite part about teaching is trying to figure out a student’s vocation. What is God calling them to be? How can I help them discover this for themselves and then trying to instill in them a confidence to say yes to that call? The whole process is really fun to watch and I feel thankful that I get to be a witness in that. In your experience, what do Catholic schools do best? In my experience, Catholic schools teach the whole child best! We get to team up with parents to educate the mind, body, and soul! We have the flexibility to be creative with the standards and how we instruct. Teachers at STA get to use our God given talents to educate and inspire students to be lifelong learners. The parent support at STA is absolutely amazing! It is truly a gift to be able to feel like you are on a team, working together to help a child succeed. I believe in Catholic education because when God is the focus of our lives, it puts meaning into everything we do. Students understand their gifts come from God, so to give glory to Him, they try their best each day. Students treat each other with respect because they know their peer is a child of God. I believe in Catholic education because learning about the Gospel is the most important work we do. It helps prepare students to continue to live, work, and pray as they become who God intended them to be.